These shops carry Unique Items including various Enchanted Essences Products such as our Pure Organic Essential Oils, Roll-on Blends, Spray Mists, Aroma Inhalers, and Aromatherapy Jewelry! Below is a form for Custom Blends. Fill out the form and hit the submit button. After you have submitted the form, if you have not yet purchased the item from the website, please go to the Products / Home Page on this website and go to the Product Category of your item....(Example "Spray Mists", "Roll-on Blends", "Aroma Inhaler", "Body Care" etc) and find the "Custom Blend" option in that category. Simply select this option to add to your cart and then complete your order through the Checkout Shopping Cart. Please Note: We will contact you by Email to Confirm your Custom Request before we fill the order. If you request an Essential Oil (or Botanical Flavor) for your blend that is not in our Inventory, it may be out of stock and we will notify you regarding availability. Our Current Inventory consists of the Essential Oils Listed in the "Caelestis Pure Essential Oils" Category and we also have Botanical Flavors of Peach, Orange, Mint, Chocolate, Black Cherry, Vanilla, Lime, Coconut, Pineapple, Banana, Rose, Cinnamon. These Pure, Organic, Edible Flavors are great to add to Custom Body Butters, Massage / Bath Oils, Sugar Scrubs and Lip Balms! 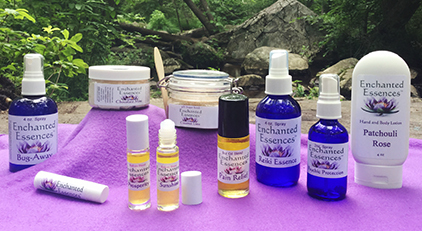 The products and services by Enchanted Essences make no claim to cure or prevent any disease or medical problem and is not intended to substitute other therapy or medical advice. Aromatherapy can work in harmony along with many other healing modalities. Please consult with your health care professional if you have questions or concerns. In the case of pregnancy, our products or essential oils should not be used without complete education, in which case avoid use. All products are for external use only. Discontinue if irritation occurs.